When the weather is nice out, nothing is a better activity than getting your bike out of the garage and going for a beautiful ride. That is, unless you’re constantly interrupted with your pedaling when the bike chain falls out and you have to stop to fix and get your hands all oiled up. Bleh. Yes, I could get it fixed at a shop, but screw that noise. Peeves like those are why I’m particularly drawn to the Bicymple, a design that strips the chain component to make the entire vehicle more flexible. Basically, it’s two unicycles attached with a bar. Who knew such a concept could turn into an interesting, minimalist bike? From the looks of the demo video, the Bicymple sure looks like a fun ride, and maybe slightly more difficult than your average bike. We could only wonder about the physics and how much weight you have to put into the front and rear wheels to properly control the bike. Questions aside, the stylish and minimalist design is something that’s always trendy and appreciated in our eyes, and we hope you think it’s cool, too. Editor’s Note: Apparently, our dear leader Micah Abrams seems to severely disagree and think this design is absolutely preposterous. Here’s how he thought we should have run the piece. Enjoy his counterpoint. Stay with us here. Apparently, the problem with the bicycle lies in the chain. Granted, chains have a lot of joints and are greasy and can occasionally slip off their gears, which results in very black fingers and sometimes a ruined shirt. But, seriously, that’s like one percent of the time. The rest of the time, the bicycle chain is a neat little microcosm of everything that makes a bike great: it’s cheap, easy to maintain, and is arguably the most efficient drive train in the history of mechanical engineering. So, of course, Bicymple designer Josh Bechtel decided to remove it. The reasoning, according to his website, is that, “By removing the chain, the number of moving parts and overall complexity is significantly reduced. 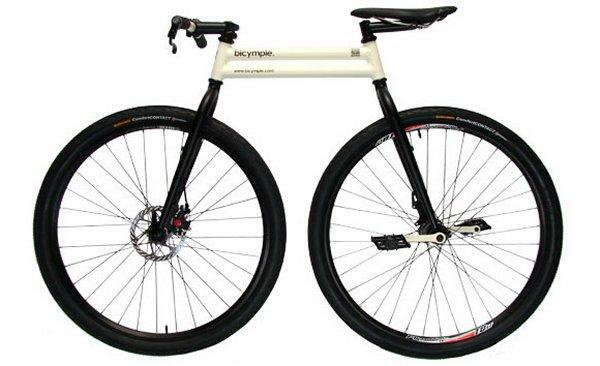 A direct-drive, freewheeling hub joins the crank arm axis with the rear-wheel axis, shortening the wheelbase and minimizing the design.” He’s leaving out something sort of important though — it makes the bike look impossible to ride! Seriously, watch that video again. Crab riding is apparently just like normal bike riding, except it’s 75 percent more hazardous to your ACLs. And, to be fair, if I had a nickel for every time I wished I had a custom swing bike on my morning commute through Manhattan, I’d be in free Starbucks for life. So, there you have it. The Bicymple — a device you never knew you needed, because … well, you don’t. Is ‘cyberwar’ another harmless buzzword, or an impending threat of nuclear proportions?